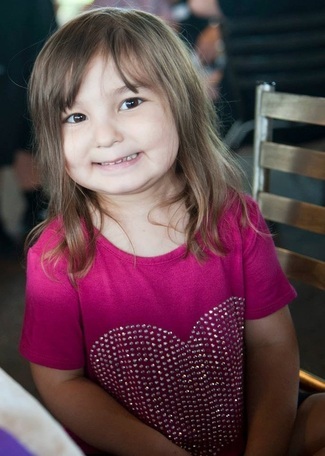 Mia was diagnosed with an inoperable brain tumor in November 2011 just as she was turning two years old. She also has spinal lesions of the same tissue type due to small pieces of tumor travelling down her spinal cord. Mia's tumor has been classified as slow-growing although it's considered cancerous and treated as such. Currently the only treatment for her is chemotherapy as surgery is too risky and radiation would need to be full brain and spine and due to her age our family and her medical team want to put that off as long as possible. She has been mostly in treatment since her diagnosis with only a couple of short breaks with her being able to be off chemo. 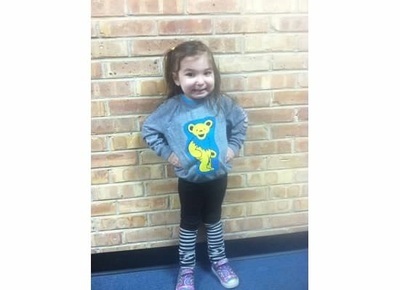 Mia started her current chemo protocol in January 2014, the hope is for her to remain on this treatment 1-2 years. She receives chemotherapy every other week which makes for some long days. Although we don't like the reason for being at the hospital Mia has learned to find comfort there from her amazing medical team made up of the doctors and nurses that she loves. She gets a brain and spine MRI every three months to take a look at the tumor and lesions to determine if the chemotherapy is working or not. Things have stayed mostly stable on this current protocol and the results of her January 2015 will be telling to see if the plan is to stay on this treatment or if she will need to switch to another course of chemotherapy medications. This is her 5th chemotherapy protocol and although this current treatment can be hard to endure we hope her body can continue to tolerate these drugs as long as her doctor feels she needs it. Her disease has shown periods of more aggressive growth and although we would ideally like to see tumor shrinkage we also know that hearing that results are stable tells us the chemotherapy is working to keep the growth at bay. Mia has an amazing older sister Rachel who will be 9 years old in January. Rachel loves basketball, minecraft, lego, reading, writing and illustrating her super creative stories and the Hawks, Cubs, Bears and Bulls. What Mia goes thru physically Rachel goes through emotionally. Cancer really does affect every single facet of our lives. Our goal as parents of these two amazing girls is to strive for normalcy which helps us and helps the girls find some comfort in being as normal as possible while our lives are anything but. We find our lives balanced between two worlds and we are constantly bouncing back and forth between the "typical" world and the cancer world. We have been surrounded by the love and support of our wonderful family and friends, our community as well as the other families we have met that are going thru their own cancer journeys. Having these amazing people in our lives helps us stay strong so that we can try to stay strong for our girls. Knowing that so many people care, making connections with others that are dealing with their cancer stories, and being reminded that we are not alone has shone us that there can be beauty in cancer. It sounds twisted but it's true. Our lives have been turned upside down in the three years since Mia's diagnosis. 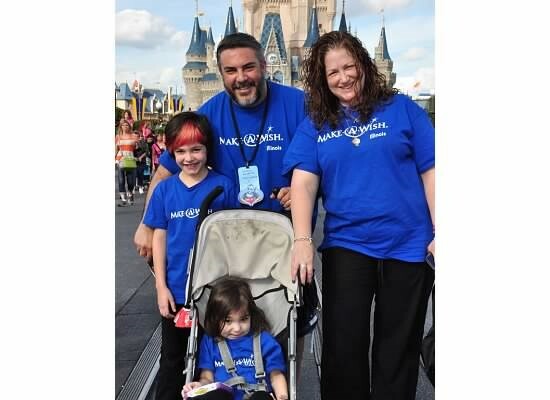 Dan has had to become the sole provider for the family so that Lisa can be home to take Mia to doctors appointments and her chemotherapy. Unfortunately Dan has been the victim of a corporate downsizing as well as a layoff since Mia was first diagnosed. Our finances were stretched as is due to the monumental hospital bills and all that comes with a serious life-threatening illness. Dealing with more than one job loss has been a huge issue for our family-those already stretched finances became even more of a mess. We are so thankful to have been selected by BTB Foundation as one of the families they are helping in 2015. It's an incredible outpouring of super kind and amazing people that truly want to help and that means the world to us. Mia turned 5 years old in November. The location of her tumor has a huge effect on her size as well as her being able to eat enough on her own to maintain/gain weight. Keeping her body as strong and healthy as possible is as much of a challenge as treating the tumor. Mia gets supplemental feeding overnight as well as during the day through a feeding tube in her abdomen. She also takes up to 5 medications 3-4 different times a day. When you see Mia she looks like the size of a 3 year old and what she lacks in size she makes up with her smile, charm, sunshine and hugs. We call her our small but mighty warrior. She's sweet and sassy and everything in between. Her favorites are the color yellow, bubble wrap, snuggling, sucking her thumb, anything Frozen and Disney Princesses, arts and crafts, singing and dancing. She loves going to school each day and her weekly dance and horseriding lessons are always looked forward to with enthusiasm and excitement. Once again, we are so grateful for this opportunity to be part of BTB Foundation and so thankful to all involved with their event.